Our pro makeup artist brushes help you take your artistry to the next level. Every makeup artist needs quality makeup brushes to create the look and make the most of their makeup investment. Whether you are a pro makeup artist or a makeup enthusiast, you will appreciate the difference between the brushes that come with an eyeshadow or palette and those that come in a professional makeup artist brush set. Makeup artists rely on pro art makeup brushes to take their makeup artistry to the next level. 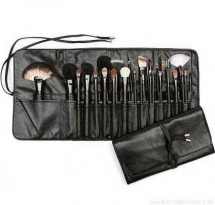 We sell professional makeup artist brushes sets. If you are looking for individual brushes please contact us; we are happy to show you our selection and add them to the other products in your order. 1. First, wet the hairs under the faucet with warm water with the brush hairs pointing downward - this will help prevent any water from getting into the ferrule (metal part) or down into the handle for brushes that don't have ferrules. 3. After you have thoroughly cleaned your brush, gently brush them on a clean paper towel and lay them to dry on their side on a paper towel or a regular towel. At this point, it's a good idea to reshape the brush to prevent splaying. Lay kabuki brushes and any other stand-up brush on their side. Never let them dry with brush hairs up in a brush holder. The water can run down into the ferrule and over time will break down the glue holding the brush together.